Modern construction projects often unearth archaeological treasures that have been buried for centuries. These discoveries also tend to unearth long-standing debates about where important public works projects stand in relation to important finds relating to cultural heritage. In Athens, the dilemma is particularly acute given its enormous cultural and historical significance and its current dire economic straits. 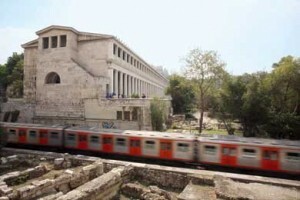 “Archaeologists believe that remnants found during construction in the area of the Ancient Agora, on the northwestern slope of the Acropolis, belong to the famed Altar of the Twelve Gods, one of Athens’s most ancient monuments and a landmark that marked the very center of ancient city, from which all distances were measured — like an ancient Syntagma Square, which marks the starting point in terms of street numbers. The Altar of the Twelve Gods (a small section of which is visible in the Ancient Agora) is almost completely buried under the lines of the ISAP train. ISAP is not willing to give archaeologists the time they need to collect evidence from the new find or to draw up a plan about how to handle it. According to the archaeologists they are 100 percent sure about the identity of the find, because the altar is one of the Athenian monuments that have been described the best in the relevant literature. …Many questions continue to eat away at experts, who are hoping that new excavations at the site will reveal all. Their hopes, however, may be short-lived if ISAP goes ahead with its renovation work as planned. This discovery has reignited the issue of jurisdiction, which has been the bane of many a construction project in Greece and has also sealed the fate of many areas of historical interest. On the one hand, ISAP is eager to complete construction work and to open this section of the railway to beleaguered commuters without further delay. On the other, archaeologists insist that further excavations in the area may contribute significantly to more discoveries about the topography of and life in Ancient Athens. They are suggesting that the tracks be elevated or diverted over a bridge, or even that the altar be dug up and moved. They believe that if the Altar of the Twelve Gods is allowed to be buried again it will not only set a precedent but also form a black mark against Greek society and the attitude it takes toward its ancient heritage. It’s a really tough question, and it won’t be the last we hear of it. I hope some kind of compromise can be reached that can serve as a model for next time that will provide for the material and cultural needs of people in need of both.